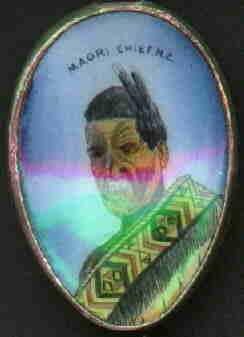 This cute spoon from Napier, New Zealand features a hand painted image of a Maori Chief. Note: the discoloration in the photo is a result of the scanner which is unable to pick up the detail on a curved surface, and not on the spoon.This spoon is silver plated. 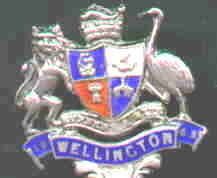 Marked as being made by J.F of Birmingham, England, 1926. 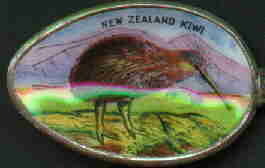 The kiwi is shown on many New Zealand spoons. The discoloration is from the scanner. 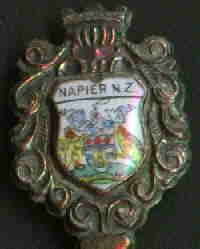 This spoon was made in Germany for resale in NZ. 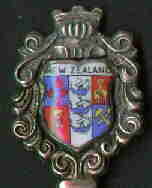 Cute tiny hand made spoon (2.5" 70mm) with paua shell finial and the coin bowl is a George V1 half penny dated 1947. Interestingly, the bowl is inverse of the front of the handle in the "old style"
Paua shell on an art deco stem--marked "silver"